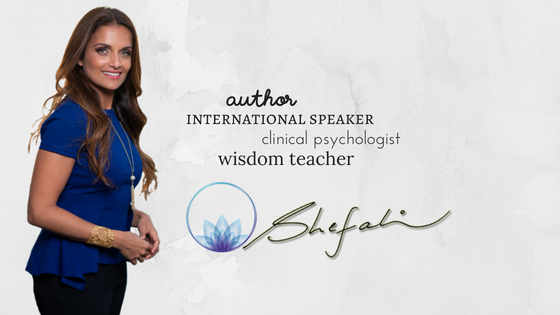 I have seen Dr. Shefali on Oprah, her TED talks, and other interviews, talk about conscious parenting. And I’ve always intellectually understood it. As parents, we need to take responsibility for ourselves, our actions, our attitudes. Only when we are able to do that, can we begin to live authentically and thus model that for our children. The light bulb went off for me when I saw Dr. Shefali on Oprah. She was talking about parents thinking they are “greater than” and practicing “supreme control”, and how this type of parenting creates feelings in our children of powerlessness, fear, invalidation, and the kicker for me… “no connection to their authentic self.”. In order to strengthen that connection to their inner self, we need to replace control and blame with understanding and view our children as equal and, as Dr. Shefali put it, as our “awakeners” and “teachers”. Stay present in the moment. When things are chaotic and you are rushing here and there, it is hard to do this. It takes work. But when you can stay in the present moment, it is easier to see where your reaction, or over-reaction is coming from and then promptly reevaluate. Try not to say NO all of the time. My son recently pointed out to me that I say No to a lot of things he asks. When reflecting on this, he was right. Dr. Shefali calls no “soul crushing” and after speaking to my son about this, it can be. I work in an elementary school and by the weekend, I am spent. When my kids ask for play dates, I have a tendency to say no because I have just spent all week with other peoples children. I explained this to my kids, and then also told them I was going to be more open to this and that we could compromise. If I wasn’t feeling up to it, maybe we could do a few hours instead of a sleepover. Reframe your responses so they are not so negative. I have been known to say in response to the why, “Because I said so!” I am trying to practice patience and give my children an explanation. Calmly. They deserve it. Learn to see the lesson in every situation. There is a lesson. We just have to be open to receive it. Have family meetings. Family meetings allow everyone to voice his or her feelings and thoughts in a calm manner. This helps my kids to feel empowered and to internalize the fact that their feelings matter and they are important. Parenting is the hardest job there is. And it is the most important one. It starts with us. And it starts with awareness and some small shifts. Where can you start making some shifts? I started being a conscious parent when my daughter was 16 she’s 17 and a half now and we were close before but now we are whole and complete together and it’s amazing!! My 3 month old is truly going to benefit from this!! Do you mind if I quote a few of your articles as long as I provide credit and sources back to your site? My blog site is in the exact same area of interest as yours and my visitors would certainly benefit from some of the information you provide here. Please let me know if this okay with you. Cheers! Oh, I love these tips! They are so concise and actionable. How is the book coming along? Have you published it yet? Looking forward to it! I love this article! Great content, such helpful tips and reminders 🙂 I feel like staying present in the moment is the key to everything! Simple but not easy! Of everything I have read, done, tried in terms of trying to become a better parent, the thing that has absolutely transformed my ability to stay calm and regulated in the midst of parenting two boys with special needs is meditating. Ever since I started a consistent mindfulness practice, my ability to stay calm and regulated has drastically improved. Love this blog and love Dr. Shefali’s message.